My thank you video has gotten over 100 likes. I shot it to thank all of the 1850 people who have followed me. 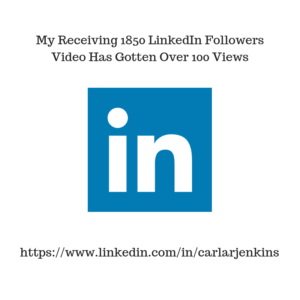 I did a Facebook Livestream but I shot a stand alone video just for LinkedIn. I upload it thinking that it would get some views. Imagine my surprise this afternoon when I checked my LinkedIn page and saw when this video received 100 likes. All I wanted to do was thank people from the bottom of my heart. I didn’t think that it would had been as well received. I so underuse LinkedIn. I need to change that. LinkedIn is the business social media. You can make so many connections there. Try it out.